So What IS The 7386? 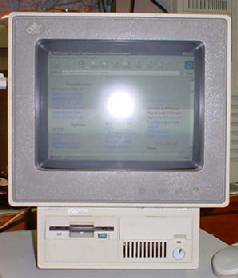 The 7386 is a planar upgrade for Model 25 PS/2 computers, marketed by IBM to the educational market. I know of one other upgrade for the Model 25. Made by Reply Technologies, the Model 25 Reply Board offers true 486 performance for the IBM PS/2 Model 25 computers. Whenever you hear about upgrading the Model 25, the Reply board will undoubtedly come up at some point. To say that the 7386 is not common is an understatement. I have the only ones I have ever seen or heard of. As rare as it is, the 7386 is a pretty decent upgrade for the Model 25, which came in three types: an 8086, a 286, and a 386sx. The 7386 adds to that a 386slc, and possibly also a 486 processor equipped system. The 7386 is not a standalone Model 25--it is a unit that was upgraded from any of the other two models, 25 or 25-286, but not the 25SX, which has a totally different system base layout. I have four of these...got 'em from my local high school. The 7386 upgrade does not go into the 25SX! The 25SX's layout is very different from a 7386 planar's layout! Note: Keyboard and mouse connectors are reversed from the way they are normally installed on a PS/2. JP8 - Memory bank selection? Easy as drop it in and go. Chips must be 70ns or faster--slower ones do not work and cause lock-ups. Make sure the chip orientation is correct, or you could damage the VRAM chips, planar, or both. Results: You won't see a speed improvement. You will, however, get the ability to run higher resolutions. WARNING: Though the 7386's SVGA chipset can do 800x600 (and beyond, up to 1280x1024) you will do serious damage to the monitor in your Model 25 if you try to run any mode outside of 640x480 at 60Hz (V) and 31.5kHz (H)!!! The only reason I know what the 7386 board is capable of is because I put one in a Model 30-286 and I used an external, multisync monitor to find out! Color depth is another story: Upgrading the RAM theoretically gives you the ability to run a higher color depth at 640x480 and beyond (see note above). I tried running 640x480 at 64K color depth, and it wouldn't work under Windows 3.11. All I got was an error, stating that "The video driver could not provide the mode requested." and then I was dumped back out to a DOS prompt. I do not know at this time what is placing the limitation on the video--the RAMDAC runs up to 1280x1024 (with 16 colors), and the video BIOS has support for that mode, so why wouldn't it have support for high color modes, just as it (seemingly) does for high resolution? The Windows 95 drivers don't help solve this problem either. From the looks of things, the ET4000AX chipset does not support high color modes. Only Tseng ETxxxxW32 chipsets support those modes. A transplant of a BIOS from a W32i based card got my 7386 doing high color, but it was not stable. Windows 3.1x and DOS seem to be the best bets. The system performs very well with either, as would be expected. OS/2 would probably work acceptably well, but I've haven't tried it and don't know. Linux--No. I tried to install Linux and it just kept locking up during the install process. Win95--As a thought, I took out the last remaining 7386 that I hadn't done anything to yet. Wired up an IDE hard disk (650MB), installed a "Diskmangler", and ran Win95 setup. Works just fine, but a little slowly. A CPU upgrade would make a big difference, I am sure. WinNT--Workstation 4.0 is the only version I've tried. It ran, but did it ever beat the devil out of the hard disk with swapping. Plus, it was S-L-O-W! Win98--Yes, but it is even slower than WinNT on this thing. The 7386 planar upgrade has support for both the hard disk that came installed in the Model 25 and 25-286, and a standard IDE hard disk.